I was invited by the students organising the action today (Friday March 15th) to receive their demands on behalf of the City Council at the end of the march. I was the only Councillor able to make it and frankly relished the opportunity. I was standing at the start of the march with local activists Mary Kerr when a group of school students started chanting ‘What do we want? Climate action. When do we want it? Now.’ I, we, could hardly hold back the tears of joy and sorrow as seasoned campaigners, hearing the cycle of radicalisation of the young and feeling very strongly how we, as a generation, had failed to turn back the tide of climate change. There are some great photos on our FB page showing the wonderful spirit of the march. Any student I talked to knew much much more about climate change than I do and was very clear about what they wanted from politicians at local, national and international level. Just look for the speeches of Greta Thunberg and you’ll get the idea. She is exceptional but there are many similarly able students closer to home, of all ages. Outside the Marlow, protesters gathered around a large blank sheet and wrote their demands. ‘A comprehensive and effective recycling system.’ ‘This is our last chance.’ ‘No more car parks.’ ‘Water fountains in the City centre.’ ‘Bring the voting age down.’ ‘More public transport.’ ‘Half a billion climate refugees by 2050! We need a plan.’ Reasonable? I think so. Urgent? Undoubtedly. In Dane John, at the band stand, there were speeches including mine thanking the students and inviting them to bring their demands to the meeting of the Policy and Resources Committee at the Guildhall on Weds April 17th at 7pm. 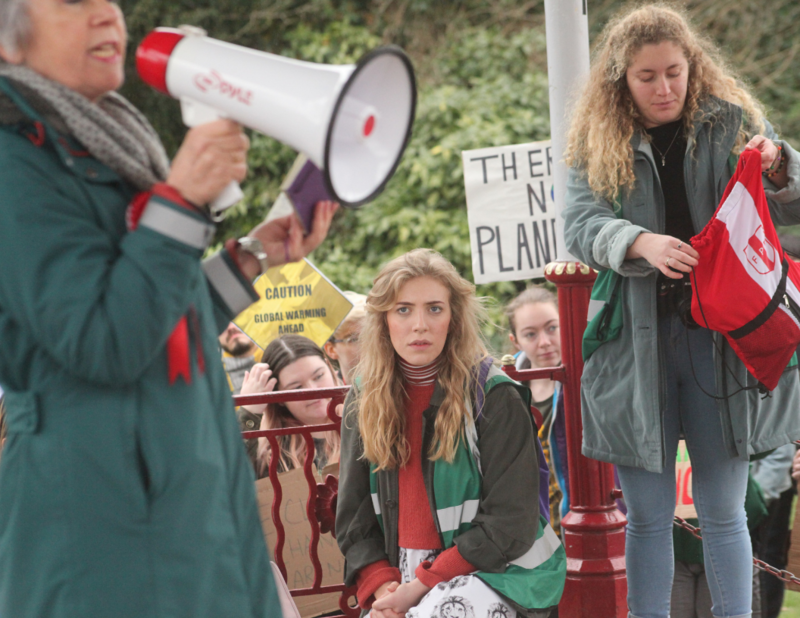 A motion asking for a Climate Emergency to be declared by Canterbury City Council will be debated there. Reading Borough Council declared one just a couple of weeks ago. I told the students that they had a right to expect that it would be approved by all councillors. I sincerely hope they do.